A NEW control room is being built to monitor shipping in Gladstone Harbour. The harbour master said it will be put to good use. Maritime Safety Queensland currently has a control room on Goondoon Street. There is a physical view of part of the harbour, but it is nothing to write home about. That will change at the end of 2013 when MSQ moves into a new bigger and higher headquarters. Most people in Gladstone are aware of the Gladstone Entertainment Centre expansion, but the project also involves a new MSQ control room above six levels of parking and office space. It will be the highest building in Gladstone. 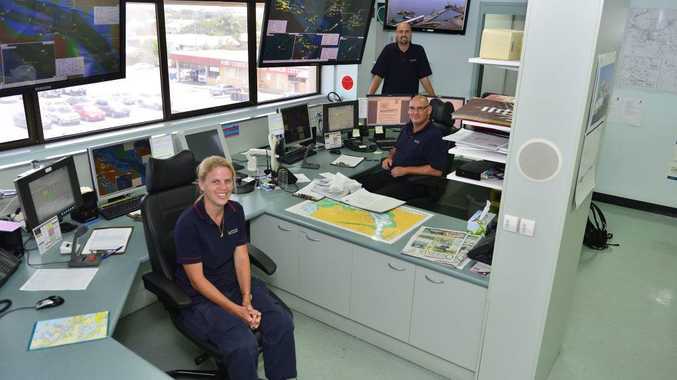 Gladstone harbour master Mike Lutze said the new control room would provide an excellent view of the whole harbour and contain upgraded state-of-the-art facilities. "We've outgrown this place," Mr Lutze said of the current base. "With the increase in vessel traffic movements, the introduction (in the next few years) of LNG and Wiggins Island (Coal Export Terminal), we are going to need an upgrade to our facilities," he said. Mr Lutze did not hide his enthusiasm for the new control room. It will have extra radar systems and other monitoring technology. Despite the use of modern technology, Mr Lutze said being able to look out the window of the new headquarters and see the entire harbour would be an advantage. "The best computer in the world is your own eyeballs," he said. ONE THING you learn by looking at Gladstone Harbour - there are a lot of big ships out there. Some of the bulk carriers that transport coal, aluminium and bauxite on the harbour are more than 200 metres long and they don't pull up on a six-pence. In the Vessel Tracking Service Centre at Maritime Safety Queensland, the traffic is carefully watched and guided like clockwork. The VTS Centre, which can be likened to the control tower at an airport, communicates with captains aboard ships and tells them when to come and go. Three VTS officers were on duty yesterday, two monitoring the harbour and a third was preparing a shipping schedule which usually includes anywhere between 14-24 ship movements a day. A series of big screens in the room show satellite maps of the harbour with the location of every ship, as well as live CCTV footage of RG Tanna Coal Terminal and the harbour.